I’m in a bikini, dangling from the edge of a granite cliff, holding my sarong out to a man in white shorts. It might sound as though I’m auditioning for a gig as an acrobat in a Cirque de Soleil show but I’m actually in a secret cove near Huatulco on a mission to gather natural purple dye from a sacred sea snail, the purpura pansa. 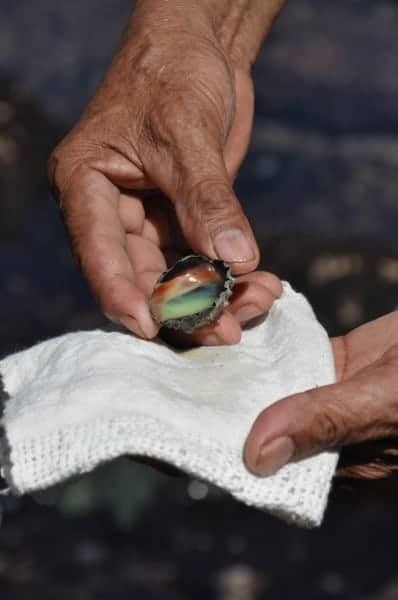 We’re accompanied by expert shell-dyer Habacuc Avendano, head of the Cooperativo de Tintoreros de Pinotepa Don Luis, the last people on earth permitted to harvest this legendary snail. The dye, derived from the purpura pansa marine snail, has been used to dye elite garments for centuries. Known as Royal Purple by the ancient Phoenicians and as tixinda in Oaxaca, it’s an essential color in the pozahuanco, a ceremonial Mixteco garment. Unlike the Mediterranean, where harvesters killed the mollusks to obtain the dye—a practice that led to the snail’s extirpation—in Oaxaca, the dye from the caracol purpura is carefully extracted from the snail, thus preserving the tradition for future generations. But even in Oaxaca, the shell-dying tradition has come under threat. In the early 1980’s a Japanese corporation called Imperial Purple Inc. nearly stripped the Oaxacan coastline of Purpura. They extracted dye in such large numbers that the snail population was driven to the brink of extinction. 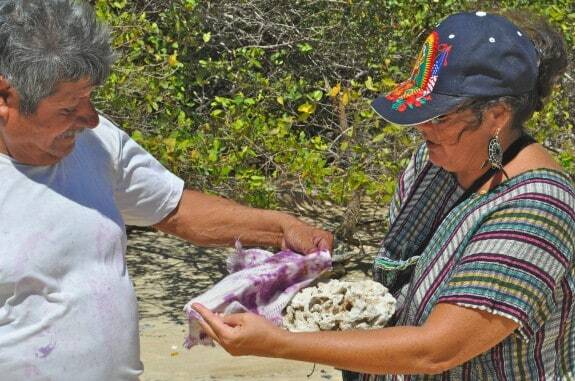 Anthropologist Marta Turok and the shell-dyers of Pinotepa successfully petitioned authorities to declare the snail habitat a federally-protected zone, arguing that Mixteco traditions and livelihood were being destroyed. Now, only licensed Mixtec dyers are permitted to harvest tixinda dye. 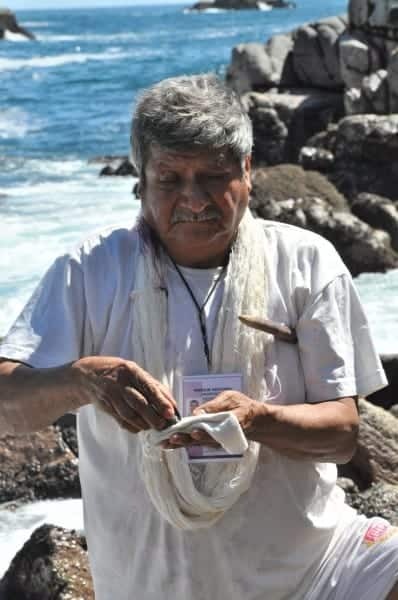 I’d been invited on the snail expedition by Patrice Perillie, a Puerto Escondido resident who, along with Habacuc Avendano and Mexican anthropologist Martha Turok, had been involved in researching Oaxaca’s tixinda population. She continues to help preserve Mixtec traditions by supporting the Tixinda Weaving Cooperative and coordinating educational tours such as this shell-dying trip. Our group departed Puerto Escondido at dawn headed by mini-van to an undisclosed cove near Huatulco. For untold generations, Mixteco shell dyers have trekked to this stretch of the Oaxaca Coast, where the tixinda snails live within rocky crevasses. At the launching beach we climbed into small boats and bounced across sapphire blue waters, passing countless small bays until we turned into a cove flanked by tall rock formations and pulled ashore. Clutching our scraps of white cloth to be dyed—ranging from sarongs to T-shirts–we set off across the hot sand to a rocky promontory. While we walked, Hubanuc explained how preserving the life of the caracol purpura snail is an important part of the Mixtec harvesting tradition. Once at the rocks, I stopped and stared. What had appeared to be picturesque from afar was actually a jumble of razor-sharp boulders, hammered by waves so ferocious the air was filled with mist. The tixinda live within the inter-tidal zone, which means shell dyers – and now us – can only reach the snails during low tide. As Habacuc nimbly scampered over rocks as jagged as dinosaur teeth. I gingerly retraced his steps, placing my feet in crevasses to hold myself upright. “Is this a tixinda?” I asked, pointing hopefully to a brown snail in a pool of water. My companions were also calling out possible sightings from their precipitous perches. Tixinda are elusive. Even with environmental protection, the snail population is diminishing due to illegal poaching and climate change. Finally, Habacuc spotted several tixina and, using a rounded stick, gently pried one off the rock and held it out for our examination. I was surprised at the snail’s modest appearance. A non-descript grey, it looked rather unremarkable for a producer of such coveted dye. “Pass me your cloth,” he said, balancing on the edge of a cliff, snail in hand. I held out my white sarong and Habacuc delicately squeezed the dye-bearing underbody of the snail until a few drops of milky yellow liquid dripped onto the cloth. The yellow mucus stored in the snail’s hypobranchial gland acts as a narcotic for paralyzing its prey. “It can take the liquid from 400 snails to dye one skein of cotton,” explained Habacuc pointing to yarn strung loosely around his arm. He then replaced the snail back onto the rock where it quickly reattached itself and repeated the process, snail by snail, dabbing mucus until our cloths were covered in yellow splotches. “Isn’t the dye supposed to be purple?” I wondered, finding it hard to believe royalty would be interested in wearing garments covered in yellow polka dots. I got my answer minutes later when photo-oxidization began doing its magic. The yellow splotches slowly transformed into green, then violet and then a deep purple that grew in intensity the longer it was exposed to sunlight. Finally, the laborious shell-dying process was complete. Arms aching, I returned to the beach where our group compared purple creations. Although the Tixinda Weaving Cooperative also uses blue from the anil (indigo plant) and red from cochineal (cacti bug) as natural dye, this purple is the most highly prized color in the Mixtec community—it’s featured in the posahuanco, a traditional garment worn upon marriage and as a burial shroud. But the color purple doesn’t fetch a premium in the mainstream market. 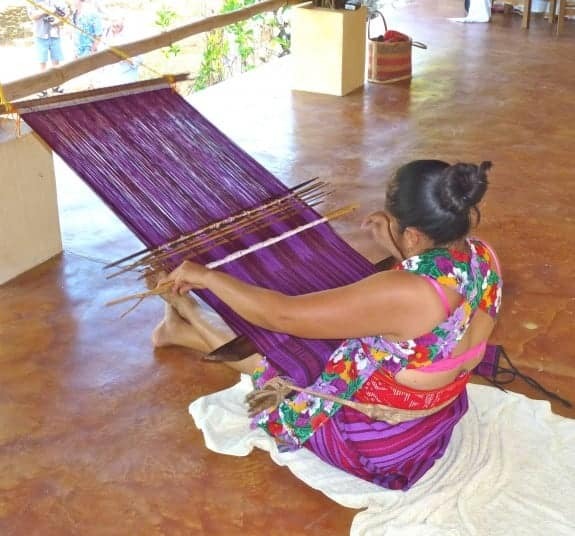 “Unfortunately, most consumers don’t appreciate the amount of work involved with natural purple dye and aren’t willing to pay a higher price, “ says Stephanie Sneiderman of Tia Stephanie Tours, a company that offers multi-day excursions highlighting Oaxacan cuisine, weaving and culture. “The other challenge is that the remoteness of Pinotepa de Don Luis means there is limited access to clients,” she says. Her cultural tours help raise awareness of weaving craftsmanship. 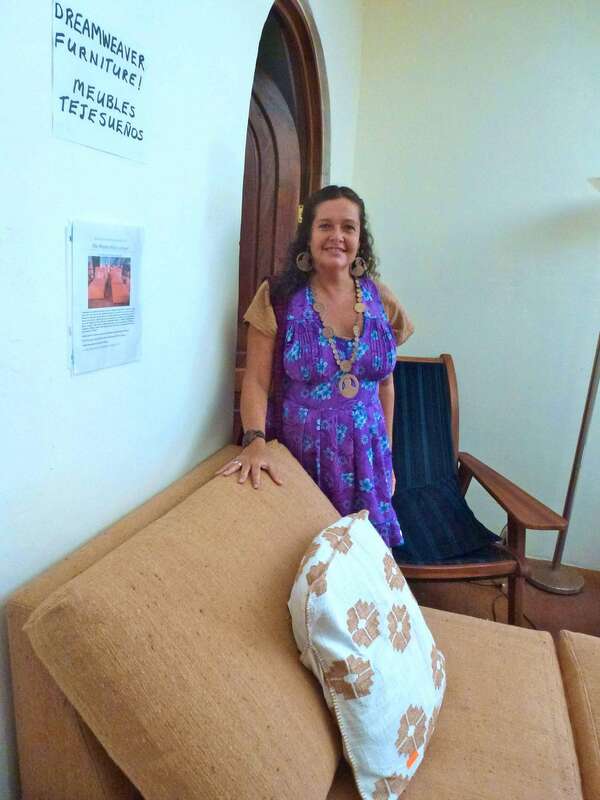 Also helping support the Pinotepa weaving community is Patrice Perillie who hosts the Dreamweavers Annual Weaving Exhibition and Sale in Puerto Escondido each January. This full day event featuring cuisine, music, crafts and backstrap loom weaving demonstrations has become a major source of income to the cooperative. “We believe cultural diversity not only makes for a more interesting world, it makes for a more stable and balanced world, where ancestral knowledge gets passed on from generation to generation,” says Sneiderman. As I headed back to Puerto Escondido, slightly sunburned and with shell-dyed sarong in hand, I hoped that these ancestral traditions and the sacred snail itself would survive for future generations. Tia Stephanie Tours: These multi-day journeys though Oaxaca, Chiapas, Yucatan and other states showcase the culture and ethnic diversity of Mexico. 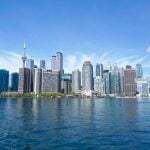 Visit: tiastephanietours.com or email info@tiastephanietours.com. Where to Stay: Find apartments, condos and vacations homes to rent in Puerto Escondido and book early if you’re planning to visit between January and March or holidays. 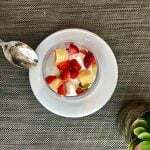 Hotel Santa Fe offers fine-quality Dreamweavers products for sale in Puerto Escondido. This article is so quintessentially you. Hanging with the locals, helping the community, a sacred snail and just a wee bit of fashion. Loved it. The tixinda is really quite fascinating, isn’t it? And it sounds like a fun bit of adventure to search them out. Very interesting info about the shell dying and weaving. What an interesting story. I used to weave, love natural dyes and did not know about this. The snails colors are amazing. Too bad, like much else in our world. they are endangered. This made me think of cochineal- and insect that they get crimson dye from here in NM. What a gorgeous purple! And how great is that that the snails get to survive? 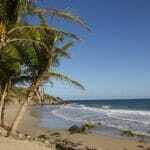 The Dreamweavers show and sale sounds an excellent reason to visit Puerto Escondido in January. Amarvellous story to dye for!! 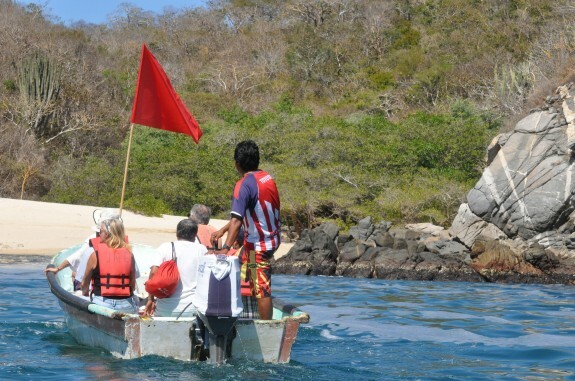 What a fascinating story about the parts of Huatulco hidden behind its resorts. Great pictures, too! Thank you! 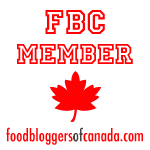 Very good article, specially as it updates what is going on nowadays at the Coop. But the Mixtecos are not the “last people on Earth…” The Brunca People have also kept this dyeing tradition alive for centuries in the Pacific coast of Costa Rica, managing Plicopurpura pansa. They also make beautiful textile pieces. I will send to you a 2005 article by anthropologist Chang. Please, send a message to my e-mail address.